Hey friends! 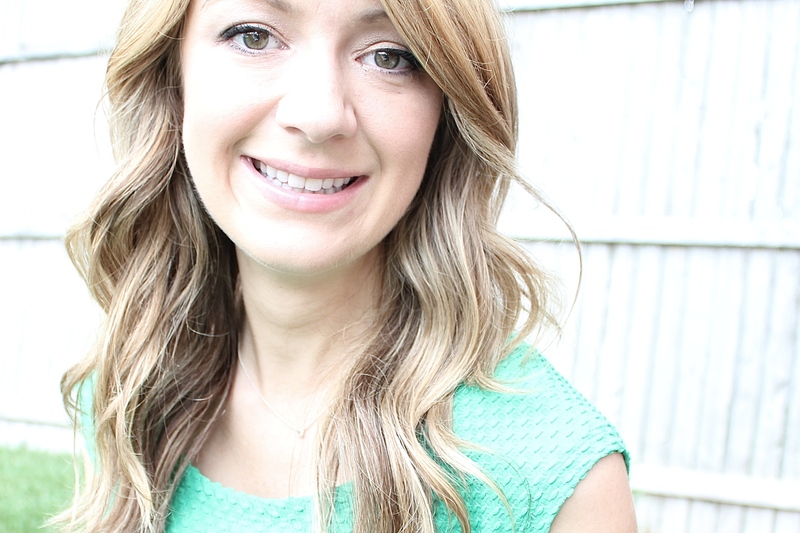 I hope you have a wonderful Labor Day weekend! I will be working a ton but it is supposed to be GORGEOUS here in West Michigan for the holiday. Be sure to grab that sunscreen and get some time in at the beach for me!! 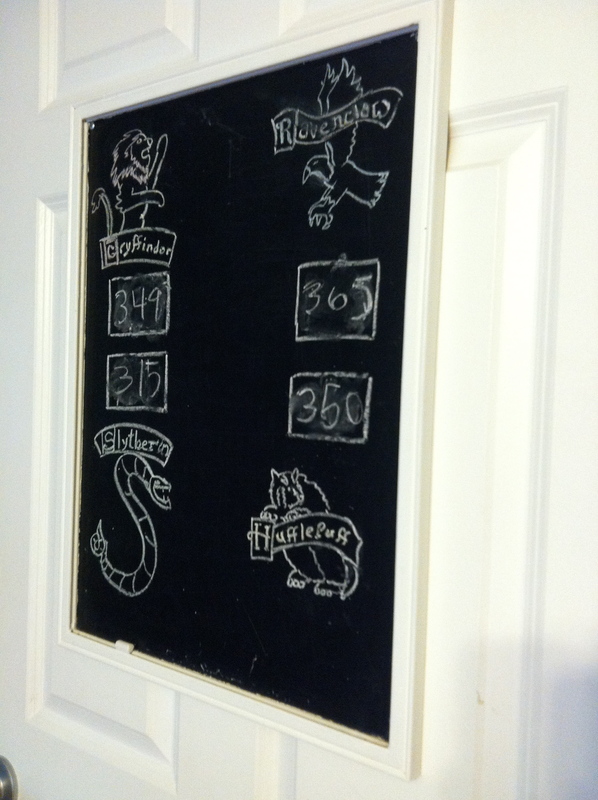 Since we moved in to our home in June, we have been keeping a tally for the House Cup a la Harry Potter. Everyone who visits is asked to pick a Hogwarts house. We award and demote points based on behavior. For example our cat, Sammy, receives points for Slytherin by not hissing at children. 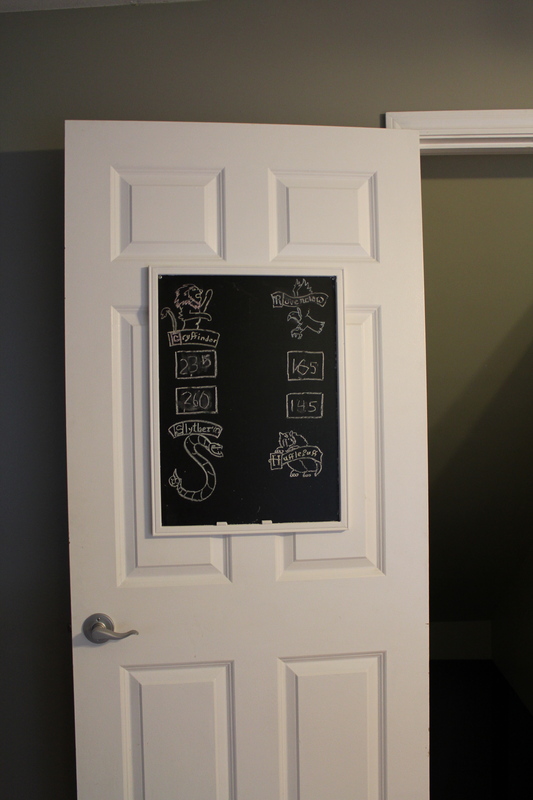 We use a chalkboard to keep track and it hangs on the door to the basement. Tyler did the drawings of each house’s crest! The only rule is that you can not give/demote points to your own house. Here is the score as it stands today: Go Ravenclaw!! It has definitely become a fun game with our friends and it is common to hear 5 points being awarded in the middle of conversations! I think I need to make a House Cup next so we can all keep our eye on the prize! One of the things we love most about our home is the location! We love living in Grand Haven and enjoy many activities in and around our town. I wanted to create a series that explores some of the great things that West Michigan has to offer. We have a ton of different shops and restaurants in Grand Haven since we are a tourist town. As we draw closer to Labor Day, we decided to venture down to the pier and take advantage of the dwindling crowds on a weekend evening. Kurt and I love to park at Chinook Pier and walk along the boardwalk to the lighthouse. 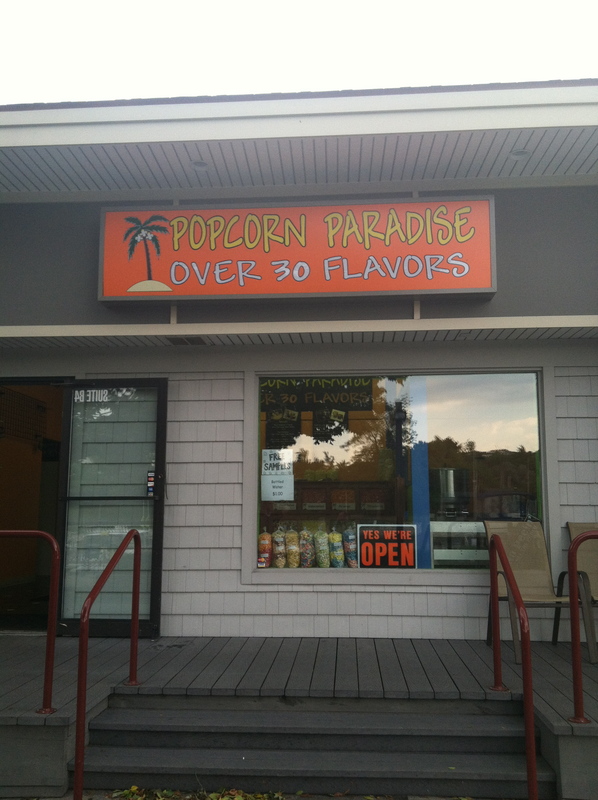 One shop that we have recently discovered on the pier is Popcorn Paradise. What a cool place! 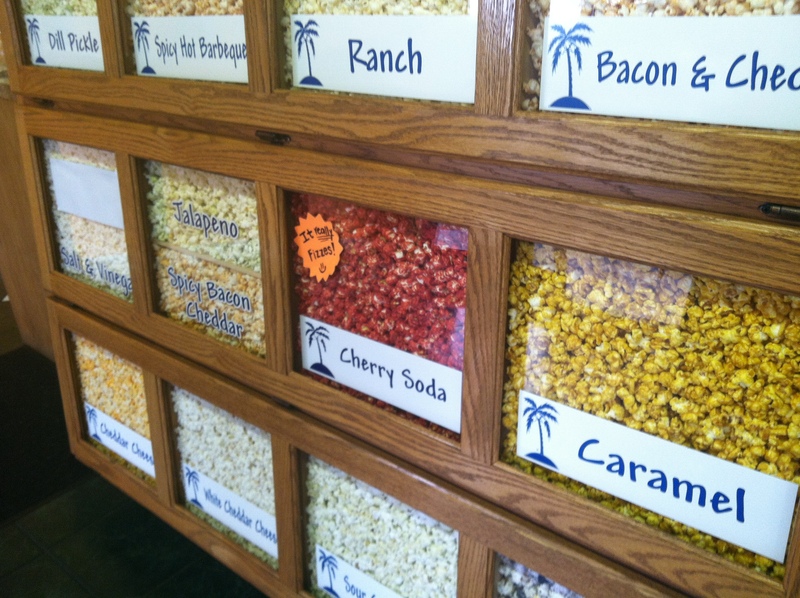 I love that this is a family owned business and they make the popcorn on site! 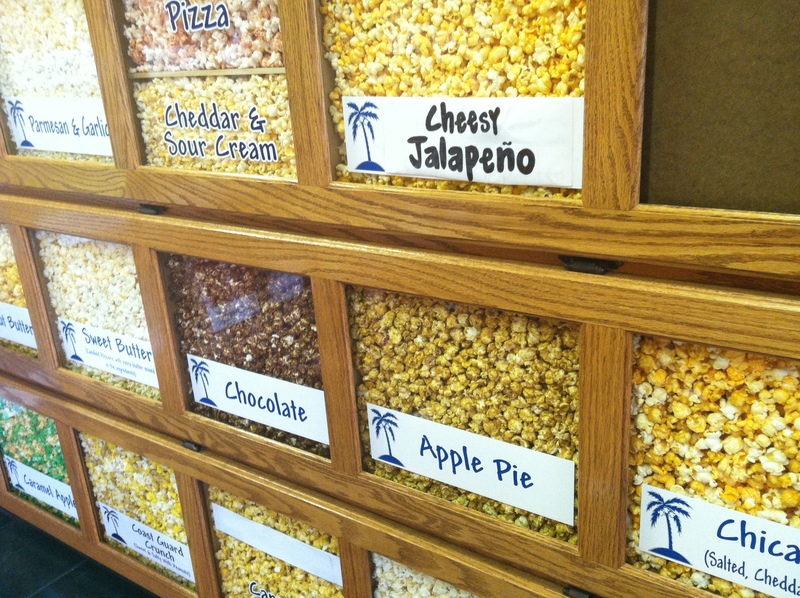 All of the popcorn is Michigan grown. They have over 30 flavors to choose from ranging from sweet to savory. 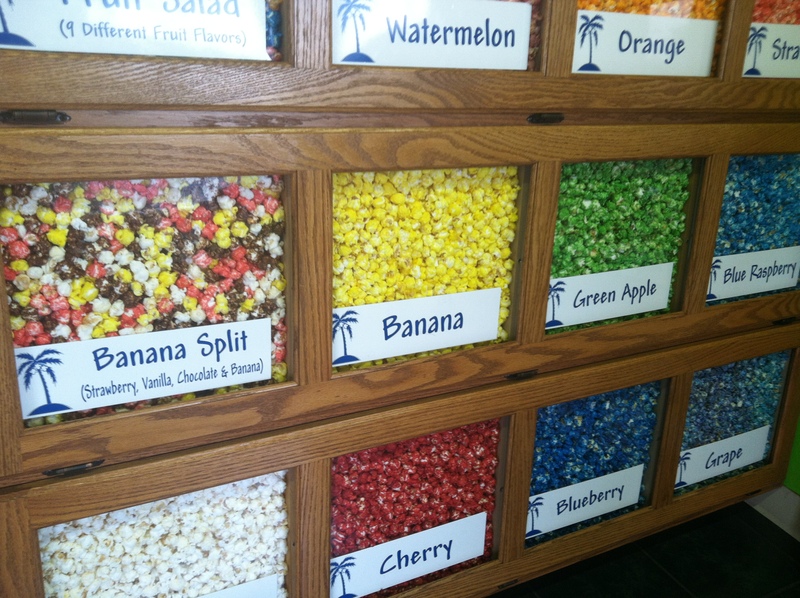 We loved the banana split popcorn! It was so sweet and full of flavor. We had to try the Pizza flavor for my brother. It was really good! In fact, everything that we tried was so wonderful it was hard to choose! Everyone was so nice and let us try any flavor that piqued our interest. We tasted a ton of popcorn but eventually settled on a layered bag with sweet butter and toffee. It is AMAZING! 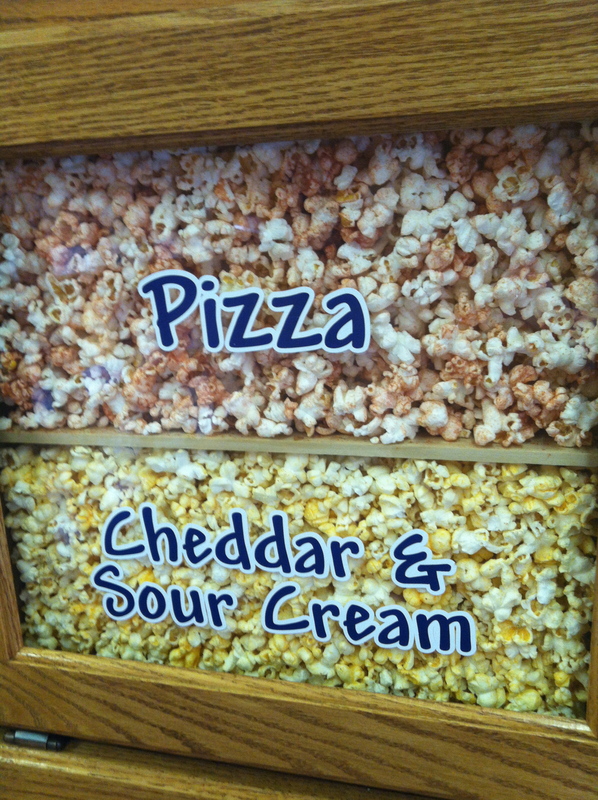 We will definitely be going back to get our popcorn fix! They sell three sizes of bags, sampler packs, and tins. This would be a great gift, party favor, or souvenir for our of town guests. With over 30 flavors to choose from there is something for everyone! No, I’m not talking about Christian Bale in the Prestige, I’m talking about our Double Hammock! 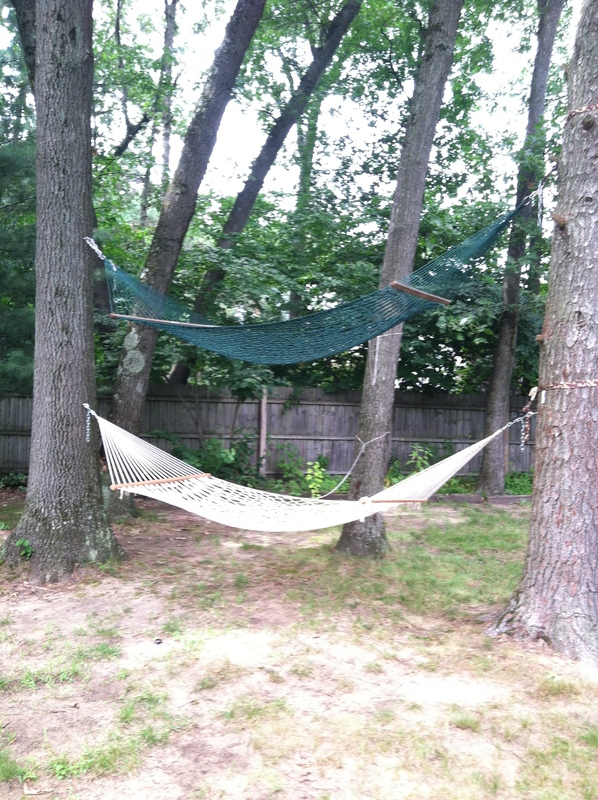 Kurt’s sister and her husband were super generous and gave us two hammocks to hang in our back yard! Kurt and Tyler were so excited to hang them! How to they access the top you ask? Well, they have to get a running start, jump up and climb the nubs on the tree. 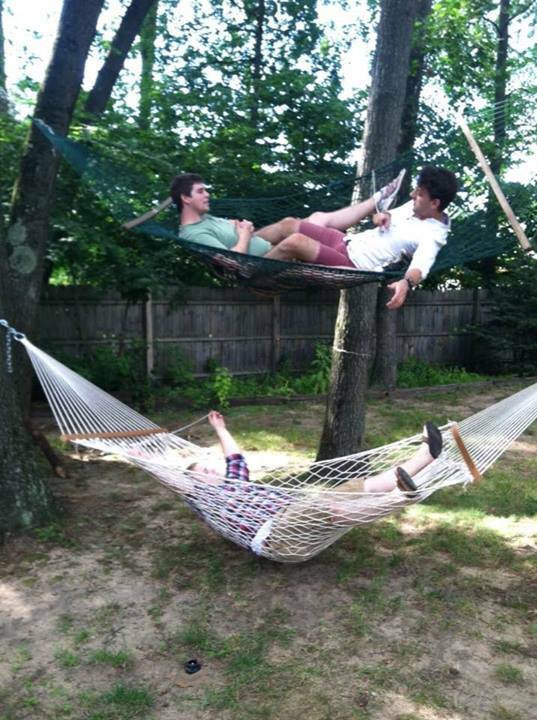 Then they have to do a trust fall into the hammock. Yikes! They are getting pretty good at getting up there now! They actually wanted to go three high, but I told them I would rather have a chair on the deck 😉 Are you a fan of hammocks? Love the look of stacked hammocks like a pirate ship? Or are you a little too scared of heights like myself and prefer something anchored to the ground? Kurt and I love playing board games. 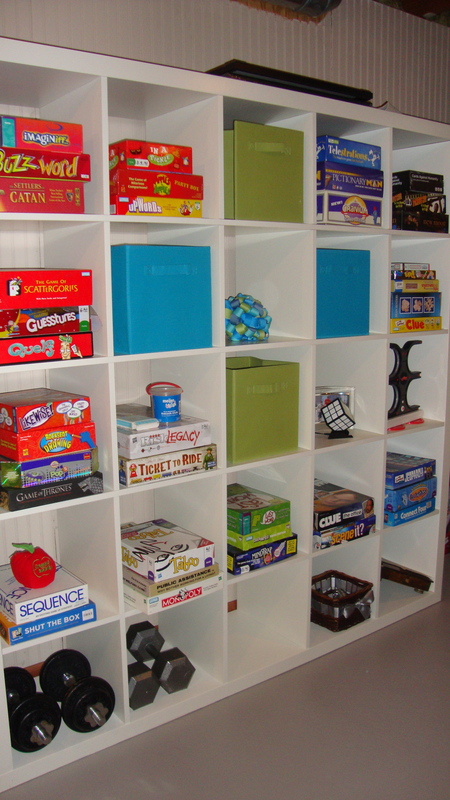 We love it so much, that we are dedicating a whole room in our basement to our board game obsession. 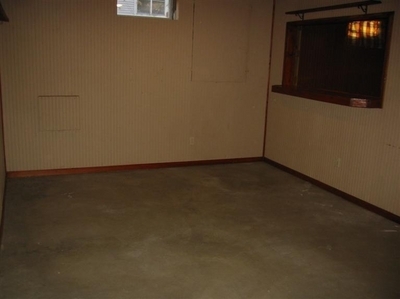 This is what the room looked like when we bought our house. So far we have painted the floor a taupey gray. We also hung up some of the ribbon balls that we used as pew decorations for our wedding to add some more color! 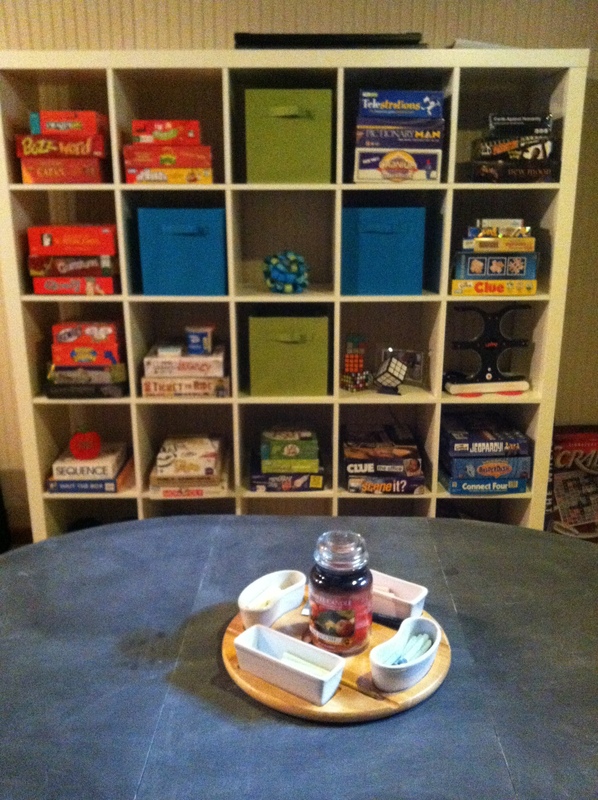 Our friends gave us an awesome game table as a housewarming present that they updated with chalkboard paint. I up the lazy susan fondu set that I have had since college in the middle and filled it with different colored chalk to keep score! In June, my brother and I made an Ikea roadtrip and we picked up an Expidit bookshelf. I knew it would be perfect to house all of our games. It is HUGE! I also picked up a few bins from Target to hold smaller bagged games and card games. Of course, they are blue and green! Looking at all of our games makes me so happy! I can’t wait to paint the walls, add a fun area rug, comfy chairs, art and maybe a few barstools.